Ards and North Down Borough Council is leading the way to the borough being Fairtrade. It will join other UK councils in helping to make Northern Ireland a Fairtrade devolved region as has already been achieved in Scotland and Wales. Fairtrade is a global movement for change that works to guarantee a better deal for disadvantaged producers in the developing world. It helps to secure better prices, decent working conditions and fair business terms. The Council now serves Fairtrade products at its meetings and in its offices and canteens. Ards and North Down towns, Holywood, Newtownards, Comber and Donaghadee, are also to become Fairtrade joining Bangor which was awarded Fairtrade status by the UK Fairtrade Foundation in March 2011. The Council has established a Fairtrade Steering Group that will begin to champion a range of changes to this, such as encouraging the serving of some Fairtrade products in local cafes and restaurants, schools and churches. 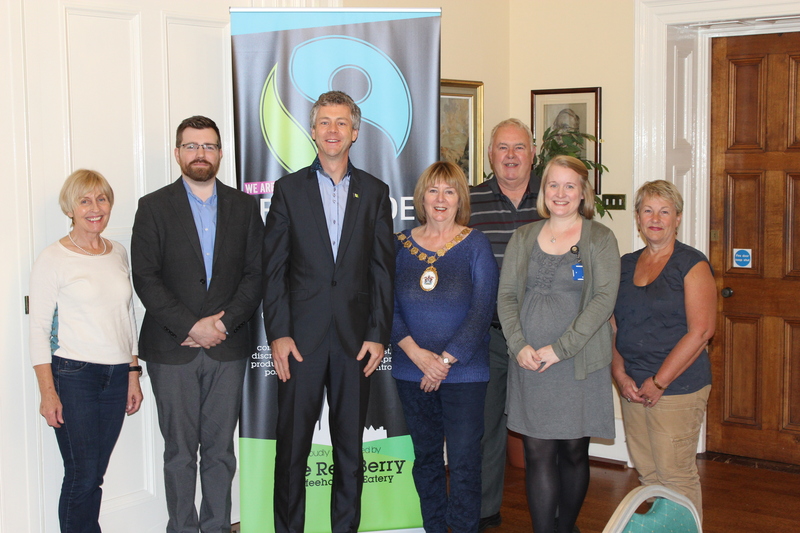 Photo Caption: Pictured (from left to right): Violet Bowler; Glynn Orchin; Dr Christopher Stange; Mayor of Ards and North Down, Deborah Girvan; Alderman Bill Keery; Emma Adair; Rachel Surgenor, members of Ards and North Down Borough Council’s Fairtrade Steering Group.